One of the most important avant-garde films to have emerged from Britain during the 1970s. 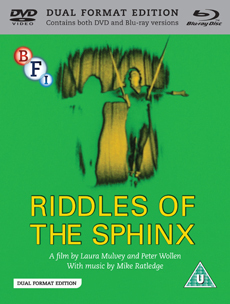 Laura Mulvey and Peter Wollen’s visually accomplished and intellectually rigorous Riddles of the Sphinx is one of the most important avant-garde films to have emerged from Britain during the 1970s. The second collaboration between Mulvey and Wollen, both of whom are recognised as seminal figures in the field of film theory, Riddles of the Sphinx explores issues of female representation, the place of motherhood within society and the relationship between mother and daughter. Composed of a number of discrete sections, many of which are shot as continuous circular pans, the film takes place in a range of domestic and public spaces, shot in locations which include Malcolm LeGrice’s kitchen and Stephen Dwoskin’s bedroom. The film’s ground-breaking electronic score, by The Soft Machine’s Mike Ratledge, was composed on synthesisers which were developed in collaboration with Denys Irving (the man behind the mysterious and controversial 1970s band Lucifer). Newly mastered to High Definition, this extraordinary, era-defining work is presented here with a wealth of essential bonus material, including a newly-recorded feature-length commentary by Laura Mulvey, Mulvey and Wollen’s film Penthesilea: Queen of the Amazons (1974), and a video interview with Laura Mulvey in conversation with the University of Breman’s Winfried Pauleit. Also included is an extensive booklet with new essays and complete film credits. Presented in both High Definition and Standard Definition. Mastered to High Definition from materials preserved at the BFI National Archive. Newly recorded Laura Mulvey audio commentary.